What Does The Fox Inspect? We love having helpers at our Fort Worth Home Inspections. 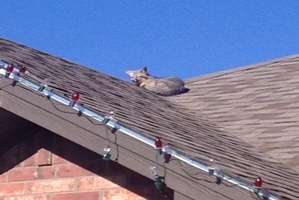 This fox was enjoying some sunshine and really didn’t want us on the roof. Our Inspectors inspect all roofs. The ones we can access we get on and walk and the ones that we cannot access we take great photos from the ground. Sorry Mr. Fox you are going to have to move so we can provide our Five Star Service for our clients.